The attentional biases of individuals with high and low levels of depression and anxiety were tested using the Attentional Blink paradigm. A rapid serial visual presentation (RSVP) task was used to detect biases in identification of emotionally valenced target images. The independent variables were depression, anxiety, lag of target stimulus, and emotional valence of target images. The dependent variables were accuracy, reaction times, and pupil dilation. As predicted, attentional biases were found for symptoms of both depression and anxiety, independently and co-morbidly, for dependent variables. The data suggest that there are both differences and similarities in the effects of symptoms of anxiety and depression on attentional biases around emotional stimuli. From birth, the world around us is occupied by sensory stimuli, at a magnitude impossible to comprehend as a whole. Therefore, it is necessary to attend to stimuli at a localised level in order to make sense of the environment around us. Attention, however, is not a singular cognitive process that can be explained in concrete terms. There is no one definition of what attention is or of how we attend to stimuli. For example, Broadbent (1958) suggests a model of attention based on an information processing system run through a series of attentional filters. He argues that stimuli are run through a sensory filter, resulting in minimised information being fed through towards higher level processing and working memory (i.e., a “bottleneck” model of attention). Conversely, Treisman (1969) has argued that everyday stimuli have thresholds that are significant to the individual, whereby information of higher importance (e.g., own names and familiar faces) have a lower attentional threshold and are more likely to be attended to. Both models imply an underlying bias within attentional selection, enabling researchers to investigate hypotheses of attentional bias. Evolutionary cognitive psychologists argue that selective attention is vital for the survival of a species, as visual and temporal selective attention are not the only important mechanisms for pinpointing a stimulus in time and space (Vul, Hanus, & Kanwisher, 2008). Indeed, the valence of a stimulus is just as important when determining whether it is a threat (Daly & Wilson, 1999). For example, an individual attends to the noises of predators in their environment, or the colours or smells associated with fire, which are perceived as dangerous. Although it has been argued that valenced stimuli are attended to automatically (Compton, 2003; Phelps, 2006), Beck (1976) reasons that they are subject to the individual’s schema, which in turn can be used to predict a pattern of attentional bias. Not only do schemas bias what we attend to, but the selective attention promoted through schematic memory is reinforced as repetition of attention occurs (Greenberg & Beck, 1989). This can be prevalent in populations with mood disorders such as depression and anxiety. Since the “cognitive revolution” of the early 1970s, it has been suggested that people with depression preferentially attend to negative information. For example, they may display a bias in attending to sad advertisements or bad news (Macleod, Mathews, & Tata, 1986). Nolen-Hoeksema, Morrow, and Fredrickson (1993) go so far as to say that depressed individuals show signs of rumination around negative information, memories, and emotion. The literature suggests that depressed individuals may attend to negative stimuli more slowly. However when they engage with it they have a significantly greater difficulty in shifting their attention away from the negative stimulus than non-depressed individuals (Bradley, Mogg, & Lee, 1997; Mogg, Millar, & Bradley, 2000). Although cognitive function has been found to vary with severity of depression (Sweeney, Stokes, Wetzler, & Kocsis, 1989), these findings have been reported among both clinical and non-clinical populations (Mogg et al., 2000). It is important to recognise that attentional resources in depression are not reduced, but that they are allocated differently in the form of an attentional bias (Channon, Baker, & Robertson, 1993). Typically, these studies are evidenced by data drawn from the emotional Stroop task (Williams, Mathews, & MacLeod, 1996). The emotional Stroop task is the traditional measure of attentional allocation within participants with anxiety (Mathews & Macleod, 1985). However, whilst it is understood that people with depression have difficulty disengaging attentional resources from negative stimuli, it has been suggested that individuals with high levels of anxiety are biased to attend to threatening stimuli, and focus resources on actively avoiding them (Caseras, Garner, Bradley, & Mogg, 2007). There is a large amount of literature arguing that in an emotional Stroop task, participants with anxiety disorders (e.g., general anxiety disorder, social phobias, high trait anxiety, and panic disorder) are slower at naming the colours of words relating to threatening stimuli (e.g., fire, knife) compared with words unrelated to their concerns, (e.g., table; Hope, Rapee, Heimberg, & Dombeck, 1990; Mathews & Macleod, 1985; McNally, Reimann, & Kim, 1990; Richards, French, Johnson, Naparstek, & Williams, 1992). Furthermore, it has been noted that not only does the degree of anxiety have an effect on interference in the Stroop task, but also that the type of strategies used to cope with anxiety may affect performance. For example, repressors of negative stimuli reported the lowest levels of subjective stress and the highest levels of physical arousal during the task (Weinberger, Schwartz, & Davidson, 1979). This is because repressors have a limited ability to access personal negative self-memory (Davis, 1987) and therefore find threatening words less stressful. Thus, the elaboration of the meaning of a stimulus is actively avoided. Reaction times are a key component in the Stroop task, as they allow researchers to obtain a valid behavioural measure of attentional biases. By measuring the time taken to correctly respond to a task, psychologists can determine whether the stimuli are interfering with working memory consolidation in certain groups of people. For example, in participants with depression there is an influential effect of negative stimuli on reaction times (Gotlib & McCann, 1984). Participants are slower at correctly identifying the colour of negative words, which may be caused by the negative meaning interfering with their attentional processing. Furthermore, this attentional bias can be found in dot probe tasks. These involve participants responding to a dot presented behind two stimuli of different valence. It has been noted that participants with high levels of depression are slower to respond if the dot is not behind the negative stimulus, as they display a slower disengagement from the negative stimulus, thus not attending to the dot (Mogg, Bradley, & Williams, 1995). In other words, they are distracted by the negative image and do not process the appearance of the dot on the other side of the screen as quickly as if the dot were behind the negative image. The reaction time to emotional stimuli has also been investigated in individuals with anxiety using these methods. Somewhat similarly to depression, participants with high levels of anxiety are slower to respond to negative emotional stimuli in the dot probe task (Derryberry & Reed, 1994). This finding has been replicated by Amin, Constable, and Canli (2004), who found that highly anxious individuals were slower to respond to negative stimuli, yet faster than depressed participants overall. These results can be explained by the notion of avoidance of negative stimuli. Participants attempt not to attend to the negative stimuli, but must attend to them in order to complete the task. Moreover, participants with high levels of anxiety were found to have slower reaction times for anxiety related words on the emotional Stroop task than those with low levels of anxiety (Richards et al., 1992). Aside from the Stroop and dot probe tasks, a recently emerged method of measuring attentional bias is the use of eye tracking. Eye tracking provides an overt index of attention directed by movements of gaze towards specific stimuli (Kowler, Anderson, Dosher, & Blaser, 1995). Recordings from eye trackers allow for continuous implicit monitoring, providing the researcher with an initial attention measure high in ecological value (Caseras et al., 2007). Pupil dilation provides an additional implicit measure for information processing, and was used in the present study. The literature supports the usefulness of this measure for attentional tasks, number recall tasks, and mental arithmetic tasks (Ahern & Beatty, 1979; Granholm, Asarnow, Sarkin, & Dykes, 1996). Pupil diameter is larger under conditions of higher attentional allocation, memory use, or interpretation of stimuli (Beatty, 1982). Therefore, by measuring changes in pupil dilation in individuals with mood disorders when presented with emotionally valenced stimuli, an understanding of attention can be developed. However, it is important to recognise that pupil dilation is an indication of mental processing in a variety of tasks (e.g., problem solving and imaginary tasks). Therefore, this measure should be interpreted with some caution. Research suggests that depressed participants have a larger pupil diameter in the immediate period after a negative stimulus is presented, when compared with the initial presentation. This suggests that resources towards initial cognitive processing may be smaller, but once a stimulus is engaged, deeper processing occurs (Siegle, Granholm, Ingram, & Matt, 2001). Furthermore, when the negative stimulus is presented for longer, the effect of pupil diameter is significantly larger with depressed individuals than with anxious individuals (Eizenman et al., 2003). However, with depressed individuals, this effect can only be found for negatively valenced stimuli. A significant change in pupil diameter is found in individuals with anxiety. Mogg et al. (2000) reported an initial bias towards negative stimuli for gaze direction in participants with general anxiety disorder. Moreover, Prehn et al. (2008) found that positive and negative stimuli had a significant effect on changes in pupil diameter for anxious individuals when compared with unemotional stimuli. Importantly, Hess (1972) noted that if the emotionally loaded stimulus contained shocking content and was perceived as threatening, anxious individuals’ pupils dilated initially followed by a constriction, simulating the perceptual avoidance associated with anxiety. A more contemporary measurement of attention can be found through the phenomenon of the Attentional Blink (AB). The term “Attentional Blink” was coined by Raymond, Shapiro, and Arnell (1992), and the AB paradigm is one of the most documented failures in temporal selective attention. It refers to the inability to report a selected target in a rapid serial visual presentation (RSVP) when a second target is placed earlier in the stream and causes interference. If one target (T1) is placed within 200 to 500 ms in the RSVP of the second target (T2), the AB paradigm shows that T2 identification is disrupted (Vul et al., 2008). During the RSVP, T1 may have long-term effects on attention to T2 (Broadbent & Broadbent, 1987). It was originally argued that this phenomenon was the result of attentional disturbances explained by bottleneck theories of attention (Chun & Potter, 1995). However, recent findings suggest that the AB reflects a failure in visual selective attention over discrete objects (Nieuwenstein, 2006; Olivers, 2007). Critically, the RSVP task primarily engages encoding and is subsequently associated with memory, even though it is arguably an attentional processing paradigm (Rokke, Arnell, Koch, & Andrews, 2002). Therefore, it is possible that the paradigm can be used to investigate the unconscious biases in mood disorders. When a stimulus is presented in an RSVP, depressed individuals attend to negative stimuli regardless of the speed of presentation (Macleod, Mathews, & Tata, 1986; Mogg & Bradley, 2005). Therefore, a negatively valenced T1 interferes with T2 identification if T2 is presented between 200 to 500 ms away from T1. An AB is present when there is a 200 ms lag between targets in depression, although highly depressed participants can present a longer AB of up to 400 ms when T1 is a negative stimulus (Koster, Raedt, Goeleven, Franck, & Crombez, 2005). However, participants with depression also display an AB when the stimulus is neutral (e.g., an AB letter task), which suggests that they may have a general attentional deficit compared to control groups (Rokke et al., 2002). Mogg et al. (2000) found that for gaze measurement, anxious individuals showed increased initial attention capture by negative stimuli over neutral stimuli, when compared to depressed individuals in an RSVP task. Again, this reflects the idea of attenuation and avoidance of threatening stimuli. There is evidence to suggest that the level of anxiety has an effect on attention in the AB paradigm. Arend and Botella (2002) found that participants with high levels of anxiety presented a shorter AB than those with low levels of anxiety when T1 was emotionally charged. This suggests that highly anxious individuals showed avoidance behaviour for both positive and negative stimuli. Depression and anxiety, however, are commonly examined alongside each other in AB studies as the two mood disorders are co-morbid (Clark, Watson, & Mineka, 1994). Therefore, there are not many studies distinguishing anxious and depressed participants. When considering the validity of data, a lack of distinction between depressed and anxious participants is arguably problematic. As the literature suggests, each group displays attentional biases differently and thus results in these studies may be confounded. Moreover, following a literature review, there is no research that investigates the effect of anxiety and depression in a fully crossed design using an RSVP containing an emotionally manipulated T1 stimulus. The present study was designed to fill this gap in the literature. The research investigated the emotional AB paradigm in participants with symptoms of depression, anxiety, and both comorbidly, allowing the effects of depression and anxiety to be separated as two different variables in the attentional task. A pre-selection questionnaire containing the Beck Depression Inventory (BDI; Beck, Steer, & Brown, 1996) and the Liebowitz Social Anxiety Scale (LSAS; Liebowitz, 1987) allowed participants to be categorised as either high or low in depression and anxiety in a fully crossed design. Both scales have been found to be valid and reliable indexes of the symptomology investigated in this study (Fresco et al., 2001; Richter, Werner, Heerlein, Kraus, & Sauer, 1998). An RSVP task was used for the main experiment, whereby participants were asked to correctly identify the orientation of a greyscale T2 image following an emotionally manipulated T1 image (either positive or negative valence). Importantly, a lag of either 200 ms or 800 ms was used between T1 and T2, as the literature suggests that these are appropriate times for the AB paradigm to be investigated (Vul et al., 2008). Furthermore, to make this research unique, both explicit and implicit dependent variables were measured, including accuracy, reaction times, and pupil dilation. It is possible that the results of the present study may indicate attentional biases in symptoms of depression and anxiety, and therefore be of use in clinical settings. In other words, the results of AB measures may indicate biases associated with symptomology, thus revealing the potential for a diagnosis of depression or anxiety. Moreover, such a measure could be used in a clinical setting for record keeping of symptom improvement alongside standardised questionnaires. However, the task should be replicated using a clinical sample to confirm these implications. Three sets of hypotheses were made in the present study. First, it was hypothesised that the accuracy of participants in the HDLA (high depression, low anxiety) group would yield a more pronounced AB at a lag of two compared to a lag of eight when T1 was negative, due to a difficulty disengaging from negative stimuli. It was also expected that when T1 was negative, there would be a smaller AB, and higher levels of accuracy for those in the opposite condition (LDHA; low depression, high anxiety), as participants should be actively avoiding the negative stimulus, thus enhancing T2 identification. Furthermore, it was expected that a higher level of accuracy would follow positive T1 images, when compared to negative T1 images, across conditions. Second, it was hypothesised that there would be an effect of anxiety on reaction times for negative stimuli, as the literature suggests that highly anxious participants are generally slower than participants with lower levels of anxiety (Richards et al., 1992). It was also expected that participants with high levels of depression would have slower reaction times than those with high levels of anxiety when T1 was negative, because of the disengagement effect previously discussed. Furthermore, it was hypothesised that regardless of the level of anxiety, participants high in depression would be slower than participants low in depression due to a stronger attentional bias towards negative stimulus. Third, it was hypothesised that a main effect of pupil diameter would be found for participants with anxiety at a lag of two compared to a lag of eight for negative stimuli, due to the shock dilation followed by constriction (Hess, 1972). Participants with high anxiety levels would have larger pupil dilation than those with low anxiety levels, as more cognitive resources are used to actively avoid negative stimuli. Finally, participants with depression were not expected to show an effect of pupil dilation for the RSVP task, as dilation is known to occur in the seconds after a stimulus is initially presented, which is not possible to assess in this paradigm. All participants were recruited via the Research Participation Scheme (RPS) for psychology students at the University of Kent. The sample was therefore one of convenience, as the participants were required to take part in studies for their undergraduate degree. An initial sample of 335 students completed the pre-selection questionnaire, which assessed levels of depression and social anxiety. Only participants that met the conditions (i.e., as described in the Materials section) were invited back for the RSVP task. A total of 53 participants completed the RSVP task. However, eight of those were removed due to a failure to obtain an accuracy score of above 55% across all trials. The final number of participants in each group was: 14 in LDLA (low depression, low anxiety), 10 in LDHA (low depression, high anxiety), 9 in HDLA (high depression, low anxiety) and 12 in HDHA (high depression, high anxiety). Group allocations were determined using previously established cut-off markers for each measure (see Materials section). Participants’ mean age was 18.98 years, 2 were male and 43 were female. In the pre-selection questionnaire, all participants completed two scales to assess levels of depression and anxiety: the Beck Depression Inventory (BDI; Beck et al., 1996) and the Liebowitz Social Anxiety Scale (LSAS; Liebowitz, 1987). When completing the BDI, participants indicate frequency of experiences such as “sadness” over the past two weeks on a Likert scale of 0–3 (0 = I do not feel sad, 3 = I am so sad or unhappy that I can’t stand it). Scores of 13 and above indicate high levels of depression and scores of 12 and below indicate low levels of depression. The LSAS is designed to assess the severity of feelings of social anxiety and consequent avoidance behaviour. Participants score statements such as “telephoning in public” on a Likert scale of 0–3 for both anxiety and avoidance of situation (0 = never, 3 = severe/usually). Scores of 60 and above indicate high levels of anxiety and scores of 59 and below indicate low levels of anxiety. These scales were issued as a voluntary online questionnaire created using Qualtrics software. Average scores across answers were then calculated, allowing participants to be sorted into four fully crossed conditions of LDLA, LDHA, HDLA, and HDHA. An appropriate sample was then invited to take part in the RSVP task. The RSVP task was created and run using E-Prime software. Experiment stimuli consisted of 60 negative images (T1), 60 positive images (T1), and 250 neutral images (some of which were used for T2). 17 images were presented in each trial. All images were sourced from the International Affective Picture System (IAPS; Lang, Bradley, & Cuthbert, 1999). T2 was always a neutral image that was either inverted or upright (see Figure 1). Furthermore, T2 was displayed in greyscale for each trial, whereas every other image was displayed in colour. It was indicated in the instructions that T2 (i.e., the greyscale image) was the image to attend to. There was always a minimum of three images following T2. Eye tracking was recorded using a Tobíi T60 XL device. Example images of positive and negative T1 stimuli and upright and inverted T2 stimuli used in the RSVP task. Positive T1 and Negative T1 were coloured images in the task. Images adapted from Lang and colleagues (1999). The present study had four independent variables: (1) level of depression; and (2) level of anxiety (i.e., both between-subjects variables); (3) lag between T1 and T2; and (4) emotional valence of T1 image (i.e., both within-subjects variables). 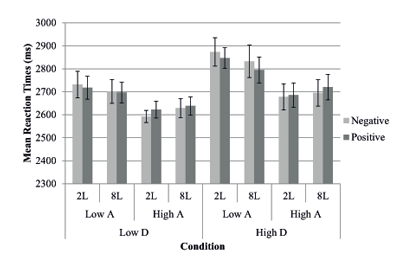 Therefore, statistical analyses were run with a 2 (depression: high vs. low) x2 (anxiety: high vs. low) x2 (T1-T2 lag: two vs. eight) x2 (T1 image valence: positive vs. negative) mixed-subjects design. The dependent variables in this study were the accuracy of T2 identification, the reaction time for accurate answers, and pupil dilation throughout the visual stream. The pre-selection task began with instructions on how to complete each scale. All participants were made aware of their right to withdraw, of the sensitive nature of the questionnaire, and were asked to give their written consent. They were then issued with the scales (i.e., the BDI followed by the LSAS). Upon completion of the questionnaire, a debrief form was given to participants. This included contact details of the researchers in case participants wished to withdraw their data and/or had further queries regarding the nature of the questionnaire, data handling or personal responses. Participants were then contacted within a month of completing their questionnaire with an invitation to participate in the RSVP task. Participants who took part in the RSVP task were again made aware of their ethical rights and issued with a consent form prior to commencement of the study. The eye tracker was calibrated to each individual using the Tobíi software. This entailed the participant following a marker across the screen with only their eye movements. This was to ensure that any readings taken during the RSVP were of the highest validity. The participant was then given instructions on how to complete the task on screen and given the opportunity to ask any questions. They were instructed to look for the greyscale image (T2) that would appear within the stream of images. At the end of each RSVP stream containing 17 images, participants had four seconds to identify whether the greyscale image (T2) was the correct way up (by pressing the z key on the keyboard) or inverted/upside down (by pressing the m key on the keyboard). During six practice trials, participants were made aware that images would be shown at a rate of 200 ms/image and that this was slower than the real task. Participants were also prompted for a response during the practice trials to habituate them to the task. After the practice block, any further questions were answered and participants were informed that they would be given a break between the six main blocks of the experiment in which they could rest and have their eyes recalibrated. The RSVP task consisted of six main blocks, each containing 30 trials of 17 images. In every trial, T2 always appeared either two or eight images after the manipulated T1 image in the RSVP (see Figure 2). Response times were measured in milliseconds. Upon completion of the study participants received a verbal and written debrief from the experimenter and were once again reminded of their ethical rights. If participants enquired about the four test groups and/or which one they were in, disclosure was granted after the experiment with a firm explanation of the non-clinical nature of the questionnaire results. Schematic of the RSVP task. N= neutral image, T1 = emotionally manipulated image and T2 = target image for identification. Each image was presented at a rate of 100 ms, with a total of 17 images in a trial and three neutral images always ending the stream. 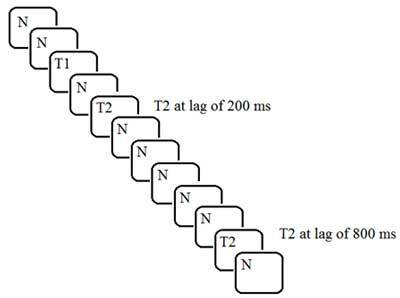 T2 was presented at either 200 ms (a lag of two) or 800 ms (a lag of eight) after T1. All images were presented centrally on the screen. The study was granted full ethical approval by the ethics board at the University of Kent. All participants were treated in accordance with the ethical guidelines set out by the University of Kent and the British Psychological Society (BPS) for both tasks. Statistical analyses were run on participants’ scores in the pre-selection questionnaire to verify any significant differences between the groups taking part in the RSVP task (see Table 1). In the BDI scores, there was a significant effect of depression, F(1, 41) = 111.01, p = .000, partial η² = .73, but no significant effect of anxiety, p = .079. This verified the cut-off scores for participants with depression, as there was a significant difference between the scores of those with high or low levels of depression. In the LSAS scores, there was a significant effect of anxiety, F(1, 41) = 149.4, p = .000, partial η² = .76. This verified the cut-off scores for participants with anxiety, as there was a significant difference between the scores of those with high or low levels of anxiety. However, there was also a significant main effect of depression for the LSAS data, F(1, 41) = 26.17, p = .000, partial η² = .39. There was a significant difference between the scores of those with high and low levels of depression. As the literature suggests that anxiety and depression correlate (Clark et al., 1994), it is not surprising that both LSAS results are significant. Likewise, differences between the groups were as expected. Scores of Pre-Selection Questionnaires for Final Participant Set. Note. BDI = Beck Depression Inventory, LSAS = Liebowitz Social Anxiety Scale, LD = low depression, HD = high depression, LA = low anxiety, HA = high anxiety. The data were analysed using a 2 (depression: high vs. low) x2 (anxiety: high vs. low) x2 (T1-T2 lag: two vs. eight) x2 (T1 image valence: positive vs. negative) mixed ANOVA. Significant interactions between IVs were followed up using t-tests to determine which variables in which groups caused the significant effects. Independent t-tests were run to compare between-subject effects and paired t-tests were run to compare within-subject effects. 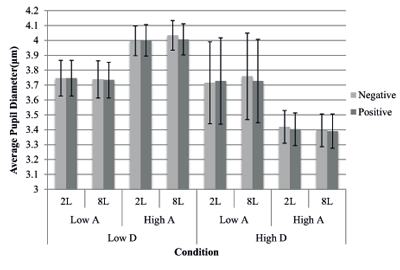 A description of mean scores by group, lag, and emotion can be found in Table 2. Mean Scores for Accuracy, Reaction Time, and Pupil Diameter. Note. All scores are listed to three decimal places to accompany histograms of data. The accuracy data measured how many correct hits the participants achieved by correctly identifying the orientation of T2 within the time period. Incorrect and non-responses were recorded as incorrect. The results are shown in Figure 3. Accuracy data for correctly identifying T2. 2L = lag of two, 8L = lag of eight, A = anxiety, D = depression. Error bars represent standard errors. There was no significant main effect of accuracy between high and low depression groups, p = .394, or between high and low anxiety groups, p = .836. There was also no significant main effect of lag, p = .350. However, there was a significant effect of emotion, F(1, 41) = 5.11, p = .029, partial η² = .11. There was a higher accuracy for detecting the orientation of T2 when T1 was positive rather than negative (Mpos = .72, Mneg = .7). There was a trend for the interaction of all variables (lag x emotion x depression x anxiety), F(1, 41) = 3.27, p = .078, partial η² = .07. In order to examine these effects further, the data were analysed separately by group. There were no significant effects of emotion or lag for the groups LDLA (p = .871, p = .764), LDHA (p = .219, p = .297) and HDLA (p = .640, p = .554). However, the main effect of emotion was significant for group HDHA, F(1,11) = 9.75, p = .010, partial η² = .47. Participants in the HDHA group were significantly more accurate at detecting T2 when T1 was positive compared to when T1 was negative (Mpos = .72, Mneg = .66). This indicates that HDHA participants were the driving force for the emotional effect in the overall analysis. Reaction times were calculated as the time taken for participants to correctly respond to the T2 identification task. There was a maximum time allowance of four seconds for each trial, starting from the end of the final image presented in the RSVP stream. Incorrect and non-responses were excluded from data analysis. The results are shown in Figure 4. Reaction times for T2 identification. 2L = lag of two, 8L = lag of eight, A = anxiety, D = depression. Error bars represent standard errors. There was a marginal main effect of depression, F(1, 41) = 3.65, p = .063, partial η² =.08. This indicates that participants with low levels of depression were quicker to identify T2 compared to those with high levels of depression, (Mhigh = 2765 ms, Mlow = 2670 ms). There was a significant main effect of anxiety, F(1, 41) = 6.08, p = .018, partial η² = .13. This indicates that participants with high levels of anxiety produced faster responses than those with low levels of anxiety (Mhigh = 2656 ms, Mlow = 2779 ms). This had been predicted based on previous research. There was no significant interaction between depression and anxiety, p = .658. No significant main effect of lag was found, p = .613. However, there was a significant interaction between lag and anxiety, F(1, 41) = 11.01, p = .002, partial η² = .21. There were no significant effects of emotion, p = .935, and no further significant interactions. In order to examine the source of the interaction between lag and anxiety further, the data were analysed separately for each anxiety group. These analyses revealed a main effect of lag within the highly anxious individuals, F(1, 21) = 4.51, p = .046, partial η² = .18, showing that highly anxious participants were slower with a lag of eight compared to a lag of two (M2 = 2647 ms, M8 = 2672 ms). There was also a significant main effect for the participants with low levels of anxiety, F(1, 22) = 6.06, p = .022, pη² = .25, who showed the reverse pattern of being slower at a lag of two compared to a lag of eight (M2 = 2782 ms, M8 = 2751 ms). Readings of pupil diameter were taken every 10 ms for both the left and the right eye, from the time the first image was presented in the RSVP to the end of the four second response period. For every reading, the eye tracker produced a validity code for the accuracy of the measure, indicating on a scale of 0 to 100% how accurate the reading was for each eye. Any sample that did not have a 100% validity code was removed from the data. The average pupil diameter of the left and right eyes was calculated across the trial period for each participant in each condition. The results are shown in Figure 5. Pupil dilation across trials. 2L = lag of two, 8L = lag of eight, A = anxiety, D = depression. Error bars represent standard errors. There were no significant main effects of depression, p = .150, or anxiety, p = .166, for pupil diameter. There was, however, a significant interaction between depression and anxiety, F(1, 41) = 6.93, p = .012, partial η² = .15. An independent samples t-test was conducted to further analyse the data. There was no significant difference in pupil size for anxiety within participants with low depression levels, p = .262. However, there was a significant difference in pupil size for anxiety within participants with high depression levels, t(19) = 2.29, p = .033. The pupil size for HDHA was significantly smaller than for participants in the HDLA group, (MHDLA = 4.04µm, MHDHA = 3.41µm). No significant effect was found between LDLA and HDLA, p = .508. However, there was a significant difference between LDHA and HDHA, t(20) = 4.23, p = .000. As seen in Figure 5, the effect is driven by the HDHA group, as the pupil size is consistently and significantly smaller (MLDHA = 4.05µm, MHDHA = 3.41µm). There was no significant main effect found for lag, p = .454, or emotion, p = .210. However, there was a significant interaction between lag and emotion F(1, 41) = 6.54, p = .014, partial η² = .14. A paired samples t-test was conducted to further analyse the data. No significant effect was found at a lag of two between positive and negative emotions, p = .461. However, there was a significant effect at a lag of eight between positive and negative emotions, t(44) = 2.44, p = .019. The negative T1 images led to a larger pupil size for trials with a lag of eight compared with the positive T1 images (M8neg = 3.83 µm, M8pos = 3.81 µm). There was a significant interaction between all variables (lag x emotion x anxiety x depression) F(1, 41) = 5.07, p = .030, partial η² = .11. In the next analysis, the data was split by groups. LDLA showed no significant effects of pupil diameter. LDHA had a significant effect for lag, F(1, 9) = 7.56, p = .022, partial η² = .46, showing an increased pupil diameter at a lag of eight compared to a lag of two (M2 = 4.04 µm, M8 = 4.06 µm). Furthermore, there was a significant interaction between lag and emotion for this group, F(1, 9) = 7.13, p = .026, partial η² = .44. In order to examine the source of this interaction further, paired sample t-tests were run. No significant effects were found at a lag of two between each emotion type, p = .417. A marginally significant effect was found at a lag of eight between each emotion type, t(9) = 2.17, p = .058. Pupil diameter was larger at a lag of eight when T1 was negative than when T1 was positive (M8neg = 4.07 µm, M8pos = 4.04 µm). Participants in the HDLA condition showed no significant main effects for pupil diameter. There was a marginal effect of lag for those in HDHA, F(1, 11) = 3.73, p = .080, partial η² = .25. Participants who were both high in depression and anxiety levels showed a larger pupil size at a lag of two compared with a lag of eight (M2 = 3.42 µm, M8 = 3.40 µm). Attention is not a cognitive process simply defined by one explanation or model. Instead, it is an intricate process that many psychologists have attempted to understand. Broadbent (1958) suggests a filtering paradigm of attentional allocation, whereas Treisman (1969) argues that attention is dependent upon thresholds personal to each individual. Importantly, both models advocate biases in attention. Using the Attentional Blink (AB) paradigm, this research investigated attentional biases in participants with symptoms of depression and anxiety, both individually and comorbidly. The results of this study indicate that participants with symptoms of high depression and high anxiety were less accurate in T2 identification when T1 was negative. Moreover, there was a difference in reaction time between those in the high and low level depression groups. This was also evident in those with high and low anxiety scores, as individuals with higher levels of depression were faster at identifying T2 stimuli. Finally, pupil diameter data indicates that anxiety symptoms are not sufficient on their own to induce a rapid dilation effect in individuals with high levels of anxiety. It has been argued that attention functions on both a top-down and bottom-up series of processing, therefore all stimuli are open for attention on an unconscious level (Phelps, 2006). Beck (1976) argues that schematic models predict a pattern of attentional bias, conscious or unconscious. Depressed individuals’ schemas are thought to be predominantly negative (Beck, 1976). In an RSVP task, attention is unconscious. Therefore, depressed individuals are less accurate at identifying T2 when T1 is negative, as T1 interferes with T2 attention (Mogg et al., 2000). The literature also suggests that T2 identification is less accurate when T1 is negative for highly anxious individuals (Arend & Botella, 2002). This finding is reflected in the present study, as participants in the HDHA condition were less accurate when T1 was negative. However, it was hypothesised that there would be a higher level of accuracy following positive T1 images (i.e., as opposed to negative T1 images) across conditions, which is not supported in the findings. Interestingly, the data show no such effect for participants who have high levels of depression or anxiety only. Only the comorbid participants in the sample support this hypothesis. This highlights the importance of the crossed design used in the present study, as the symptoms of depression and anxiety appear to influence each other only if both are at a higher level. The literature suggests that individuals with depression display attentional biases towards negative stimuli (Macleod & Mathews, 1991). Although the degree of bias is thought to be associated with severity of depression (Sweeney et al., 1989), rumination of negative emotion is a common theme for depressed people (Siegle et al., 2001). Based on this evidence, it was hypothesised that participants with high levels of depression would be slower than participants with low levels of depression. In addition, it was hypothesised that participants with high levels of depression would be slower than participants with high levels of anxiety. The results reflect a marginal difference between levels of depression in T2 orientation identification. Highly depressed participants appear to be slower than participants categorised with low depression, regardless of the emotional valence of T1. Furthermore, there was no significant interaction between high levels of depression and anxiety. 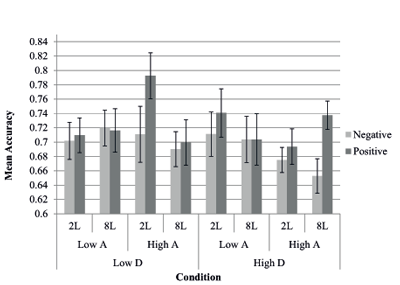 These findings suggest that a slower response may not be due to attentional bias. In fact, it may be due to an attentional deficit, somewhat contradictory to the suggestion made by Channon, Baker, and Robertson (1993). The Diagnostic and Statistical Manual of Mental Disorders (DSM-5) may be used to explain this, as symptoms of depression include a lack of interest across activities and a diminished ability to concentrate on tasks (American Psychiatric Association, 2013). Therefore, the emotional valence of stimuli may not matter if the task is not attended to at the time of identification recall. Although it is recognised that participants did not have a clinical diagnosis of depression, high scores of the BDI may indicate similar symptomatology. Caseras et al. (2007) argue that individuals with anxiety have an attentional bias towards threatening stimuli. In the emotional Stroop task, anxious individuals are slower at identifying colours of words related to threatening stimuli compared with words unrelated to their concerns, thus indicating attentional negative biases (Hope et al., 1990). Therefore, it was hypothesised that there would be an effect of anxiety level on reaction times for negative stimuli. Emotional valence did not affect reaction times of T2 identification in the participants with anxiety. However, an effect of anxiety on response time was recorded, as found in previous literature (Caseras et al., 2007). This may be due to the individuals’ coping strategies for managing anxiety (Weinberger et al., 1979). Participants with anxiety who repress negative stimuli as a coping strategy may have taken longer to consolidate information, as this cognitive process is more demanding than avoidance (Wegner, 1989). Moreover, these results are indicative of avoidance behaviour commonly associated with anxiety (Mogg et al., 1987). Furthermore, participants with high anxiety levels were quicker to identify T2 at a lag of two compared to a lag of eight, whereas those with low anxiety levels were faster at a lag of eight. The participants with high anxiety levels demonstrated avoidance behaviour when identifying T2 if it was displayed closer to the emotional T1 image. Another popular method of implicitly measuring attentional bias in anxiety is eye tracking (Van Orden, Limbert, Makeig, & Jung, 2001). Biases are measurable by gaze direction or pupil dilation (Prehn et al., 2008). Anxious individuals are reported to display a pattern of immediate dilation and constriction upon attenuation of negative stimuli (Hess, 1972). Therefore, it was predicted that a main effect of pupil dilation for participants with anxiety at a lag of two would be found for negative stimuli, when compared to a lag of eight. Interestingly, the reactions of the LDHA participants did not reflect this hypothesis. Instead, the HDHA participants displayed an increase in pupil diameter at a lag of two compared to a lag of eight. This suggests that anxiety alone is not enough to induce rapid larger pupil dilation. However, the paradigm in the present study was not long enough for an effect of depression. Therefore, it could be argued that since stimuli are filtered conflictingly due to separate patterns of attention in depression and anxiety, a higher cognitive workload is present for HDHA individuals, causing pupil dilation to occur (Broadbent, 1958). There were some limitations encountered during this research. It was difficult to recruit participants in the LDHA condition, as many did not respond to invitations in both the first and second round of recruitment. This may be due to the social anxiety symptoms stated in the DSM-5, such as reluctance to enter unfamiliar situations due to a fear of being judged or embarrassment. Arguably, this may be the reason that the sample size of some groups was lower than others. This in turn may have had an effect on the data. Results may have been influenced by inter-individual variation in some groups. Therefore a larger sample size may be beneficial for future research in this area. Moreover, the sample was one of convenience, and many participants across all conditions reported little interest in the task, possibly affecting the value of the data. It is not possible to predict whether this was the result of the sampling method, or the participant demographic (i.e., a university psychology undergraduate population). However, it is a notable limitation for the present study. Furthermore, since all hypotheses directly relating to anxiety were null following statistical analysis, the negative stimuli used may be unsuitable for testing anxious individuals. The negative images used in the IAPS are not necessarily threatening to people with anxiety. An alternative explanation could be that the results were influenced by the type of anxiety measure used. Whilst anxiety towards social situations is common within general anxiety (American Psychiatric Association, 2013) a measure focussed on general anxiety disorder may have affected the results, as images used may have been more threatening. This may be an avenue to consider for further research. Additionally, it may be of interest to record pupil diameter readings every 100 ms, alongside the 10 ms readings used in this study. A plot of pupil size could then be produced from averages in each condition for 100 ms, to determine whether shock dilation occurs immediately following negative stimuli in anxious participants. This may potentially aid the evaluation of stimulus suitability for anxiety. Moreover, it would be interesting to see if a more pronounced pupil diameter could be recorded from this design. Finally, it may be useful to consider a sample of clinically diagnosed participants in a reproduction of this study, as results may become more polarised. Likewise, the hypothesised main effects based on previous research may be found, unlike in the non-clinical sample of the present study. Furthermore, depression and anxiety symptoms were related in the sample, thus there were no pure LDHA and HDLA groups. This may have been problematic as it is hard to fully distinguish which form of symptomology may have influenced the results. It may be beneficial to use a different scale for anxiety in the future with no interaction effects of symptoms of depression. This could be done by investigating other particular forms of anxiety (e.g., specific phobias) rather than just social anxiety. Limitations aside, the present study not only shows that there are attentional biases for depression and anxiety, but that they exist for both independent and comorbid symptoms. Using accuracy, reaction time and pupillary data, it is concluded that emotional valence has an effect on the accuracy of T2 identification in an RSVP task. Moreover, levels of depression and anxiety independently influence the reaction times of target identification. There are substantial benefits of running a cross-design study, as displayed through these findings. Since depression and anxiety are often undistinguished in AB studies, it is of great importance to fill this gap in the literature if a true understanding of the symptoms of depression and anxiety is to be developed. Correspondence regarding the article can be made to hks8@kentforlife.net. American Psychiatric Association (2013). Diagnostic and Statistical Manual of Mental Disorders. Fifth ed. Arlington, VA: American Psychiatric Publishing. Arend, I. and Botella, J. (2002). Emotional stimuli reduces the attentional blink in sub-clinical anxious subjects. Psicothema 14: 209–214. Beck, A. T. (1976). Cognitive therapy and emotional disorders. New York, NY: International Universities Press. Beck, A. T., Steer, R. A. and Brown, G. K. (1996). Manual for the Beck Depression Inventory-II. San Antonio, TX: Psychological Corporation. Hess, E. H. (1972). Pupillometrics: A method of studying mental, emotional, and sensory processes In: Greenfield, N. S. and Sternbach, R. A. eds. Handbook of psychophysiology. New York, NY: Holt, pp. 491–531. Lang, P. J., Bradley, M. M. and Cuthbert, B. N. (1999). International affective picture system (IAPS): Technical manual and affective ratings. Gainesville, FL: University of Florida, Center for Research in Psychophysiology. Liebowitz, M. R. (1987). Social phobia. Modern Problems of Pharmacopsychiatry 22: 141–173. Sweeney, J. A., Stokes, P., Wetzler, S. and Kocsis, J. (1989). Cognitive-functioning in depression. Journal of Clinical Psychology 45(6): 836–842. Wegner, D. M. (1989). White bears and other unwanted thoughts: Suppression, obsession, and the psychology of mental control. London: The Guilford Press.